CERN has many traditions, but in a week that’s seen the launch of the Medical Service’s ‘Move & eat better’ campaign, it’s refreshing to note that among the oldest is a sporting one. The CERN relay race dates back to 15 October 1971 when 21 pioneering teams set off to pound the pavements of CERN. Back then, the Focus users group came in first with a time of 12 minutes and 42 seconds. Today’s route is slightly different, and the number of teams has risen to over 100, with a new category of Nordic Walking introduced, as part of the campaign, for the first time. The relay has provided some memorable events, and perhaps one of the longest-standing records in the history of sport, with the UA1 strollers’ 10 minutes and 13 seconds unbeaten for thirty years. In the women’s category, the UN Gazelles set the fastest time of 13 minutes and 16 seconds in 1996, while in the veterans category, you will not be surprised to learn that the Neutrinos to Gran Sasso team holds the record for the fastest time on the old course. Yesterday’s race, the 42nd, was also a memorable one, and I’d like to congratulate the winning teams along with everyone who took part. The relay provided a great opportunity to launch the ‘Move & eat better’ campaign, and even if you didn’t take part in the race, I hope you’ll take the time to act on the Medical Service’s message. Our doctors are not asking everyone to run a relay every day, but they are asking us all to move a little more and eat a little better. The campaign has just begun, and it has no end date. CERN is by no means unique, but with increasingly busy lives and screen-based working environments, the average body mass index (BMI) of CERN people has gradually been creeping up towards unhealthy levels over recent years. It doesn’t take much, however, to reverse the trend. Half an hour of physical activity a day, even something as simple as walking, coupled with a moderate and balanced diet, can make all the difference. 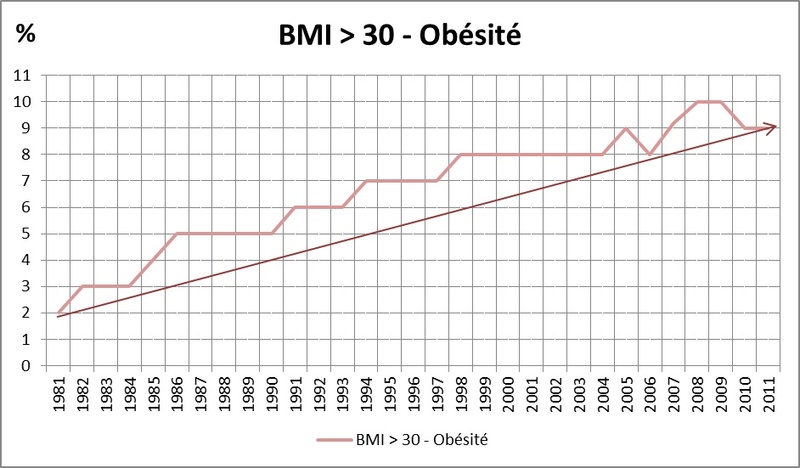 The increase in the number of people at CERN with a BMI greater than 30 over the last 30 years, taken from the campaign website. Over the coming months, there are many ways that you can get involved with the campaign. If you haven’t signed up already, now’s the time to commit to bike to work in June. Some 40 teams have already made that commitment. Also in June, we have a presentation from Per Bo Mahler, a renowned sports doctor, when we’ll also be treated to a demonstration of the Zumba dance phenomenon that’s currently taking the fitness world by storm. In September, there’s a presentation from dietician Irene Rolfo on healthy eating, and many other events will be announced as time goes by. You can keep in touch with these developments here. And in the meantime, if you don’t know your BMI it’s time to find out. Simply take your weight (in kilograms) and divide by the square of your height (in metres). Ideally, you should come up with a number in the range of 18.5 to 24.9. Whether or not that’s the case, however, it’s always important to move and eat well. The winning team was nine seconds faster than last year. Global Hope Network International was the sponsored charity – 1CHF from each runner's fee being donated to them. In the Department ranking, the Finance Department won again, as in the previous two years, but below them there was a lot of movement, with PH and EN on the podium. PS: Two tumbles in the first 100m, and one at the finish. Otherwise medical service reported no significant issues.